The first program, the New Summer Readers-Future Leaders (SRFL) is a four-week, full-day, community-based summer learning program offered to 100 rising second and third graders attending two Title I elementary schools in southeast San Diego. The program engages students in learning experiences designed to reduce summer reading loss, fuel motivation to read, enhance physical and social-emotional growth, and increase exposure to inquiry-based science activities that support new state standards. The program design is rooted in research-based practices identified by the National Summer Learning Association and other researchers. These practices include at least a 160-hour program that serves children of all reading abilities, the use of strong teachers, small class sizes, opportunities to learn outside the traditional classroom, parent engagement activities, and recreational activities. 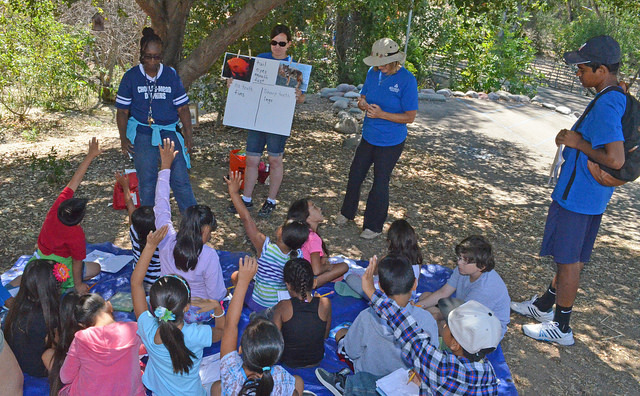 Groundwork’s role in this multifaceted summer program will be to host students from Chollas Mead and Johnson Elementary twice weekly (per school) for full mornings of outdoor exploration and STEM learning. Students will engage in experiential hands-on science learning opportunities at Groundwork’s four-acre outdoor classroom, the EarthLab. Student-teachers create opportunities to connect hands-on learning to literacy standards and nonfiction classroom reading activities. The program will run from June 26-July 21. The second program, the Summer Learning Academy, will serve as both an exciting enrichment program for students and an intensive professional development program for 12 participating teachers from Knox, Gompers and Millennial Tech. Teachers will team-teach summer school students in the morning. In the afternoon, those teachers will collaborate in a lesson study format, debriefing the instruction from the morning and preparing for the next day. Teachers will develop prototypes of “curriculum portfolios” based on activities field-tested at the EarthLab. Portfolios will include lesson guides, instructional materials required to execute lessons, teachers’ assessments of the curriculum, qualitative evaluation tools—including science notebook entries—and evidence of students’ learning. Soil erosion caused by uncontrolled water runoff. Landscaping with water-wise plants and native vegetation. For more information about student registration or to volunteer, please call JoAnna Proctor, Groundwork Education Director, at 619 543 0430.